Here is today’s amazing JewishMOM miracle for the JewishMOM.com Chanukah Miracle Festival. After Chanukah, you will have a chance to vote for your favorite miracle, and the winner will receive a grand prize of $100! Happy Chanukah, JewishMOMs! Every time a healthy baby is born it is a miracle. 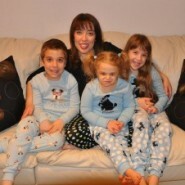 Every time I look at my three kinehora beautiful kids, I know I am blessed with miracles. But my youngest daughter, Chaya Dalya, takes the word miracle to a whole new level. Wendy with her 3 children. Chaya Dalya is the child sitting in the middle. Wendy started the organization Sweet Dreams for Kids to distribute pajamas like these in order to cheer up hospitalized children. My pregnancy with her as well as her birth already showed us that she was going to be someone very special. From not finding out I was expecting until my twentieth week of pregnancy to other medical issues along the way, this little girl was a fighter from the start. Chaya Dalya wanted to come into this world way too early, and we thought that was our biggest worry. But we were wrong. It was actually a miracle that she was born at thirty six weeks. After her birth, her upper lip was puffy. At first, they thought it was puffy from the delivery. But when things were not getting better, another doctor was brought in. An MRI was done when she was only 5 days old, and we were told again that it was nothing to worry about. We were told she would need minor surgery in her future, but we were still so thankful. At two months old, before the surgery, a biopsy was recommended. And that was when our lives completely changed. On our oldest son’s birthday, I received the dreaded call from the doctor. He said she had Rhabdomyosarcoma, an extremely rare disease, and we needed to do further testing. I felt like every bit of my life was knocked out of me. What was the doctor saying?? My daughter has cancer?! When I hung up the phone, I could not even get up from the chair because I felt so sick. We prayed a lot and hoped that this was just a big mistake. But it was not a mistake. My baby was born with cancer. I felt like I was in a living nightmare. Our new lives now involved doctors, hospital stays, chemotherapy, surgery, radiation, and all the other sorts of terrible things that go along with your baby having cancer. The only thing I could think about was this beautiful little miracle that we needed to save. 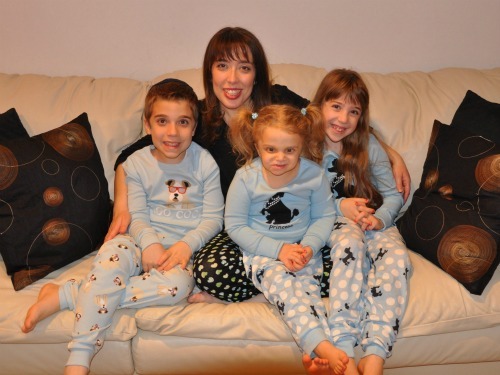 The experience was so hard on our other two kids, Reuven, three years old, and Eliana, eighteen months. After going through a few months of chemotherapy, the doctors realized it was not working as well as they had hoped. So they switched to different chemotherapy and hoped it would be more effective. After Chaya Dalya’s surgery, she was in Intensive Care and intubated for ten days. I don’t know how I handled not holding, hugging, kissing, and feeding my new baby. Then, she was given radiation along with chemotherapy. Her little sweet body had been through so much. She had to be sedated every day for radiation for four weeks. And through it all, she was a fighter. The doctor realized we were not going to give up. He spoke to Chaya Dalya’s oncologist, and came up with a plan. At that point, we added Chaya to Dalya’s name. We wanted her name to include LIFE. Chaya Dalya fought so hard to live. We knew it was not going to be easy, but we were going to fight like her. We took her to endless doctor appointments where she underwent scans and pokes and they kept a very close eye on her. Today Chaya Dalya is, baruch Hashem, six years old. She has this special sweetness about her. I always say, “to know her is to love her.” She amazes me every single day. My worries will NEVER leave my mind, but I am so thankful for the miracles in my life. I don’t know if my Chaya Dalya realizes that when I look at her, I know I am looking at a walking miracle. We live in Minneapolis, Minnesota. My life is my family. I love to do anything and everything with my kids. My mom is my inspiration. Our family started a non-profit organization called Sweet Dreams for Kids. We donate new pajamas to kids in the hospital, so they don’t have to wear the hospital ones. We wanted to do something good and help bring smiles to the kids in the hospital. We have donated nearly 3000 pairs to Children’s hospitals nationwide. You are amazing…i am in tears…what an amazing rolemodel u will be and are, to your kids and those around you…yshar coach…may Hashem bless u with nachas from your children and the only visit you make at a hospital is to deliver pajamas! Remarkable story..remarkable mom, child, and family! I can’t imagine what you went through. One nisayon after another. How wonderful that she is still with us and doing well, B”H. Thank you for sharing your story and may you and your family be well and continue to be blessed with G-d’s goodness. I was moved to tears by your story. You and your family are amazing, and I wish to echo the sentiment that your family should continue to be blessed. Thank you so much for sharing the story of your miracle. It is so special that you turned around and helped others to deal with the stress of illness. May your daughter continue to grow in good health and give you and all klal yisroel much yiddishe nachas! 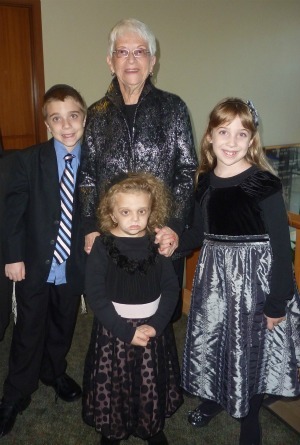 Beautiful family and beautiful Mitzvah. Thanks for sharing, may you only know of good things! Happy Chanukah! Thank you all for your kind words. It makes me feel so good that our miracle story touched your hearts. I feel blessed every single day and hope that everyone looks around to see their own miracles. Hashem gives us so many miracles. I hope our little Chaya Dalya shows everyone that good health is the biggest Bracha to have. We should all be well until 120!!! Wendy your Miracle Chaya Dalya,is a true miracle. makes us happy to just be in the same room with her. This is truly a very inspirational story, and you said you didn’t know how to write! From the Heart! That’s what you did! And for as long as I’ve known you and your family (mom included! ), I am very lucky to surround myself with “good people” like you!